Whether you have questions about our products/services or your order with us, click here to get in touch. Find out all about us and the history of Thunderpole. Join us on Facebook and Twitter, or sign up to the Thunderpole Newsletter. This is where you'll find info on shipping charges, delivery times and ordering outside the UK. Find out about your Thunderpole online account and ordering with us. We accept many different methods of payment, click here to find out more. It's very rare that our customers need to return products, however if you need to find out how here. 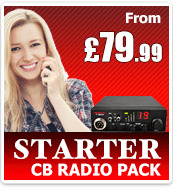 Ideal for beginners and anyone wanting to know more about CB Radio, antennas, SWR and groundplanes. 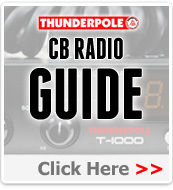 Easily find information from other CB users and Thunderpole customers. It's free to sign up and join in too. A history of Citizens Band Radio and Thunderpole. 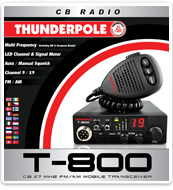 In recent years we have featured on various BBC TV and radio programmes promoting CB radio. Find out more about the different functions of CB Radios and Two-Way radios. Click here to see microphone wiring diagrams of most CB radio microphones. We have created a CB Radio User Map for you to find local users. Click here to add yourself to the map. Read all our terms and conditions here.